Used Eagle Transmissions - When the Transmission Fails Use ASAP Motors. Please complete the following fields to receive bids for Eagle Transmissions! Eagle was a Chrysler Corporation brand that produced vehicles from 1987 to 1998. It got its start when Chrysler purchased American Motors Corporation (AMC) and named a new line after the AMC Eagle. The design was intended to compete with General Motors’ Saturn and was promoted as being more European than other Chrysler models. Transmission in Eagle vehicles came in three-, four- and five-speed versions & were available in both manual and automatic for many Eagle models. What if people could get dozens of offers for replacement Eagle transmissions just by putting their information into a simple form? Yes, it’s that easy. It only takes 10-15 seconds to submit your information and you can start receiving offers from used part suppliers around the country. It is a free, no-obligation system that can be used to find quality used parts without even picking up the phone. By far, this is the quickest & easiest way to find a quality engine or transmission for your Eagle vehicle. Fill out our request form above or below to get started. Whether you need a three-speed, automatic transmission for your first generation Summit or a five-speed, manual transmission for your sixth generation Eagle 2000GTX, ASAP can connect you with the right sellers and the best prices. Eagle was a brand born of several other brands, all of whom worked with Chrysler on some level. Depending on the year and model, Eagle cars might contain parts from Chrysler, AMC, Renault and Mitsubishi. For example, while many Eagle brand cars contained Chrysler-made transmissions, the Eagle Premier used both Audi and ZF four-speed, automatic transmissions. Q: How much does a used Eagle transmission cost? A: While the price of your used Eagle transmission will depend on the year and model or your car, most customers pay between $150 and $500 for used Eagle transmissions. Q: Will my used Eagle transmission come with a warranty? A: ASAP Motors does not sell transmissions directly, but partners with parts brokers who do. We cannot guarantee that any used Eagle transmission will come with a warranty. We highly recommend that you speak with your broker to ask about the mileage and performance of your used Eagle transmission. Ask questions about warranties and be sure to complete all the proper paperwork. Q: Who makes Eagle transmissions? A: Eagle was never an auto manufacturer, but was a brand sold by the Chrysler Corporation. Because the cars came from various manufacturers and even countries, transmissions were made by, of course, Chrysler, as well as Audi, ZF and Mitsubishi. These are some of the most popular models that were sold under the Eagle automotive brand. 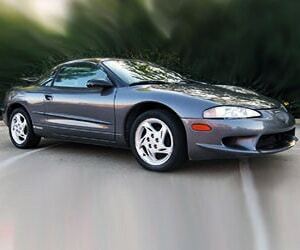 The Eagle Talon was a two-door, hatchback, coupe manufactured from 1989 to 1998. Mechanically, it was identical to Chrysler’s Laser and Eclipse, though it had unique aesthetics when it came to color options, wheels, bumpers, spoilers and tail lights. The Eagle came with either a five-speed, manual transmission or a four-speed, automatic transmission. The Eagle Premier was developed as a full-size executive car by AMC. Under Chrysler, the four-door sedan was produced from 1987 to 1991. With a large trunk, innovative light technology, roomy interior and an electronically tuned stereo system, the Eagle Premier was considered world-class and sophisticated. It featured four-speed, automatic transmissions from Audi and ZF. Made by Mitsubishi and sold by Eagle, the Eagle Summit was made from 1989 to 1996. It was a subcompact car that came in hatchback, sedan and coupe styles, and some versions boasted generous legroom and spacious interiors. Summit offered both manual and automatic transmissions in three, four and five speeds.